We visited at the right time after the Chinese new year. Usually after Chinese new year, the 10th day all the lights at the temple will be turned on. Its fully decorated with lights thousands of them. The temple will be very colorful in lights. Best time to visit if at dawn around 7 pm and above, after or during Chinese new year. Even thou beggars are common, you can either donate or just simply leave unattended. After not having been here in years, I have to say that I am still as impressed as I was as a young child. Although in the 80s there was no Kuan Yin statue, the temple still remains to be one of Penang’s most glorious landmarks. Pushing aside the markets up the stairs (which have also been there for years and a great source of a shopping bargain), and the occasional homeless person, this is a rather serene and peaceful temple with a lot of history worth looking into. Be prepared and put your walking shoes on! The temple is large! And I mean LARGE! It took us a lovely 3 1/2 hour stroll to cover the whole place, including the pagoda walk. Well recommended! Not for physical whingers. If you don’t like walking, DO NOT attempt this temple. 10,000 Buddhas, 1,000,000 steps (or so it felt)! Kek Lok See is a huge temple complex, set over multiple levels, which can be seen for miles around. You can get there on the Rapid Penang bus (201/203/204) – just tell the driver that you want to go to the temple. The walk up to the main shrine is lined with market stalls, all of whom pack up around 5:30 when the temple closes. This means great bargains as they’re looking to sell! I found that simply saying “no, thank you” and walking away dropped the prices on average by half. Children and adults alike will enjoy feeding the turtles (RM1 for a handful of vegetable matter). Inside the main temple complex there are many side temples and areas to explore. There are a lot of steps though, so be careful and take water. I was surprised at the number of gift shops within the complex itself – though sales of items go towards the temple complex, it does feel a bit commercialized. To reach the highest level you can either get on the lift (RM10 both ways) or walk. The lift is fast and air-conditioned. Up the top is the large bronze statue of Kuan Yin as well as gardens, water features and a lovely view over Penang. It is the largest Temple in SEA region. But you need extra effort to reach the top (climbing up the stairs). However, you can drive up to the top with your own car or cab. The car park slots are limited both on top and bottom. It is advice to take a bus or cab and climb up to the temple. The temple is close around 5pm (not Chinese New Year season). During the Chinese New Year, the temple is equips with colorful light bulbs. Different design every year. It is good to visit the Temple at night during that festive season. There is a wishing tree on the top near the temple. Worth for a try. The strategic to capture a nice view of the Temple is the hill bottom during Chinese New Year. This Chinese Buddhist temple has been developed over recent years most notably for it’s huge statue of the Goddess of Mercy. Located on the hillside half way up to the Air Hitam reservoir it can be seen from far away. You don’t have to be a Buddhist to enjoy a visit here but you will come away with a deeper insight into this amazing religion and with a more relaxed state of mind. There is a train up to the Statue so no hill climbing which makes it suitable for all ages. Afterwards you can continue to Air Hitam reservoir with superb views of Pinang and beautiful walks. This can be a good day out to escape the traffic choked Georgetown and Gurney. Chinese New Year at Kek Lok Si temple. The Kek Lok Si temple at night is just as beautiful as it is during the day. I was up at the hill paying a visit to the well-known Kek Lok Si temple during Chinese New Year celebration. As Chinese New Year lasts 15 days, the visiting hours of the temple is extended to mid-night throughout the 15 days. I think it’s being done this way every year. Therefore, by taking advantage of the extended visiting hours, I got off early from my work and headed straight to the Kek Lok Si temple located in Air Itam, Penang Island, as early as I could so that I won’t miss anything. After going thru the heavy traffic snarl, as you know, it’s very crowded in the road especially at this time of the year, I managed to reach there at around 8pm. Sea of Lights during Chinese New Year celebration. I drove all the way up to the temple and found a parking lot. As it was still early, there were still not a lot of people and parking spaces were still plenty. For your information, the well known stairways leading up the hill to the temple is closed at night. Therefore, you can either park your vehicle at the foot of the hill or drive all the way up the hill. The road leading to the temple is quite narrow and it requires some skills especially when there is a car coming from the opposite way. Anyway, I don’t suggest you to park your car at the foot of the hill and walk all the way up as the distance is quite far and there were some stray dogs along the road. 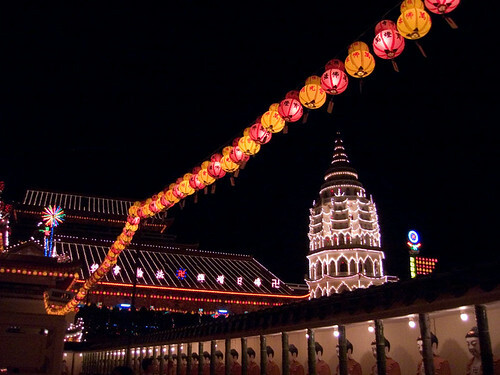 A beautiful night view of the Kek Lok Si temple. The night view of the temple is just amazing with all the lights turned on. You can basically see the temple even before you reach the hill. There were tons of avid photographers taking advantage of the situation snapping their cameras to capture the best possible views. I was one of them actually. During normal day, the visiting hours last till 6pm only and the decorations and lights seen during Chinese New Year are not normally done during normal days. One thing which I regretted not doing was taking the tramp to go up to the highest point of the temple where the Goddess of Mercy (Kuan Ying in mandarin) amidst a garden pond lies. Anyway, this section of the temple is newly constructed and there is still some construction work in progress. I think I will come to this place again next year. A spectacular view of the Kek Lok Si temple. For more pictures of Kek Lok Si temple, please visit the following flickr photostream. Previous post: A Square Where Great History Events Took Place!